Saturday 7th April 2019 will see the biggest jumps race in the calendar – the Grand National. 40 horses will compete over the gruelling Aintree fences, but how can you make a profit from matched betting on the Grand National? – And to finish in the places, i.e. the top 3 or 4 in the race. However, for the Grand National several bookies will pay out on the top 5 or 6 places. So far, Paddy Power, William Hill, Coral, Betvictor, Boylesports and 888sport will all pay 6 places at 1/5 the odds each-way. You can back a horse each-way with the bookmaker, then place two separate lay bets on the ‘to win’ and ‘to place’ markets at the betting exchange. You are then hoping that your horse finishes either 5th or 6th to win the place part of your bet at both the bookmaker and the exchange. Alternatively, place a value each-way no lay bet. 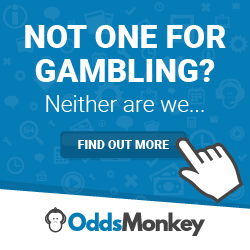 OddsMonkey Each-way Matcher can help you to identify good value each-way bets. Money back offer (up to £125) for each-way single bets placed on the Grand National 2019. This offer is available from Thursday 4th April 2019 until 11:59:59 UK Time on Saturday 6th April 2019. • Add your selections for the Grand National to the betting slip. • Tick the E/W box and enter a unit stake for each Grand National selection. The total stake will be double your unit stake(s). • Place your Each Way single bets and half of the total stake will be refunded – to a maximum of £125 per customer. • Bet365 aim to credit your refund within two hours of bet placement. This offer is only available to eligible bet365 customers who opened their account before Thursday 4th April 2019. The main promotions here are Bet365 4/1 offer and Betfair Sportsbook 3/1+ SP offer. Betfair offer a free bet up to £25 if you back a winner at SP of 3/1 or higher. Bet365 offer a risk-free bet on the next ITV race if you back a winner at 4/1 or more. The key is to find a close odds match and hope your horse wins to trigger the free bet. Opt-in to the offer at Netbet. Then, place up to a £10 win or each way bet on any Aintree race on Saturday 6th April 2019. Get a refund matching your stake if your horse falls, unseats the jockey or is brought down in the race. Find a horse with close back and lay odds such as 5.00/5.00. Place a back bet on a horse at the bookmaker. Then place a matching lay bet at the exchange. Hope the SP drifts and your horse wins for an extra payout.